Oil based stains like this deck stain are made of synthetic and natural oils. It penetrates the wood very well, is easy to apply, and has a more natural look. From what I hear, the better a deck stain can penetrate, the better it performs. It does have a stronger odor and takes longer to dry. Wood stains must meet new environmental rules that lower volatile organic compounds (VOC). Manufacturers are now increasing their production of water soluble deck stains to comply with theses rules. They are environmentally friendlier, have less of a chance to create mold and mildew growth, and are easy to clean up. A few companies like these one offer water-based deck stains. Solid deck stains pretty much look like paint covering the wood. Once you apply it you will never be able to apply a transparent stain. It does offer an excellent UV protection. It just covers the wood, so it does not penetrate it, and it will most likely peel. Semi-transparent Stains provide a transparent protective layer and allow the grain pattern to show. It penetrates very well and can be removed with a deck stain stripper. An oil base stain performs better. Semi-Solid Deck Stain is designed to almost hide all of the natural wood grain. It last longer than semi-transparent because of the increase in UV blockage. It penetrates well and provide a durable finish. Transparent deck coatings gives a natural look. It’s easy to apply, but only lasts about a year, so you must reapply annually. It does not have a very good UV protection. Clear Deck Finishes are more used for sealers as the offer hardly any UV protection and your deck will turn grey very fast. We have not made up our minds yet as to which stain to purchase. I am tempted to get the semi-transparent. If you stained your deck, I would love to hear what type you used and why, so please comment below! As it is with painting, the preparation for staining is of utmost importance. This includes cleaning, power washing, scraping, and repairs. What an awesome deck. We don’t have one and had no idea the maintenance required for it. Good luck with your project. This is great info! Thanks for sharing it 🙂 We have same issues with our deck too.. so, these tips will certainly come handy. 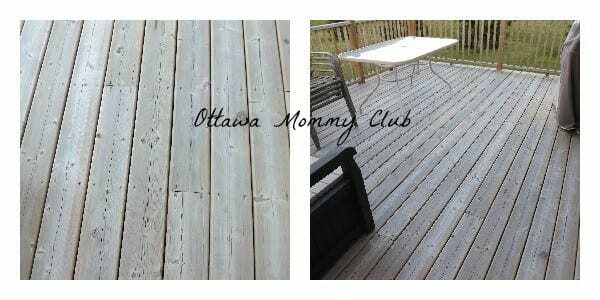 thanks for all the info, our deck is only 2 yrs old but I guess we’ll be needing to do the upkeep on it soon too. I had no idea what was involved!